Car jacking skates in the 1940s. Homepage. This page: A convenient method of moving a car around in the 1940's workshop or showroom. Harvey Frost HF car jacking skates. How to move a car around within a confined space, such as the corner of a tightly-packed showroom, or a busy, cluttered, workshop? A variety of under-car skates are available today to assist with this problem. They involve lifting the car off the ground, and sitting the wheels in specially-designed cradles, or skates, which themselves are fitted with castors. With the car thus loaded, it can be easily moved about a garage or showroom, enabling it to be pushed into the tightest corner of the space without having to resort to fiddly manoeuvres using trolley jacks and brute strength, and avoiding the risk of a car sliding off a trolley jack while being manhandled into position. 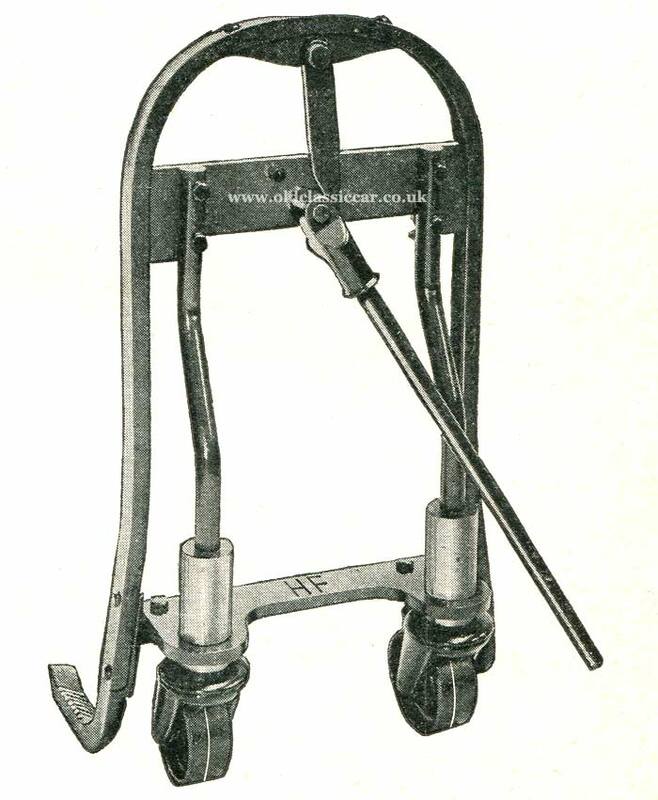 An example from the 1940s is shown here, produced by a well-respected manufacturer of heavy-duty garage equipment, perhaps best known for their range of jacks and recovery cranes, suitable for fitment on breakdown/recovery vehicles - Harvey Frost - "The Right Tool for the Job" was their slogan. The Harvey Frost solution to this issue is shown above, the HF Jacking Skate. The catalogue that I found these illustrations in dates to the late 1940s, but I'm sure that these were also to be found in garages in the 1930s. 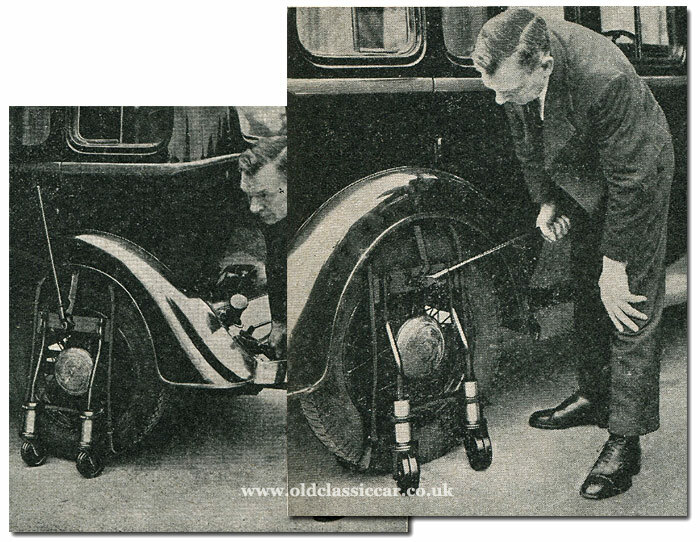 The car used to demonstrate the jacking skates is a six-cylinder 1932-1934 Vauxhall, either a 12hp ASY or the near-identical 14hp ASX (a number of period photos featuring the ASY/ASX Vauxhalls may be found on this page, in the image section of the site). In the illustrations, a suited gent is shown demonstrating the ease of use of the skates, that featured built-in jacking in its design. Firstly, the skates are positioned either side of the wheel to be raised. Arms either side of the tyre are then raised in one movement of the lever, lifting the corner of the car and locking the jack automatically. With the other wheels also raised, it was then straightforward to push the car wherever it needed to go. Buyers either had the choice of skates fitted with polished metal wheels, most suited to a concrete garage floor, or rubber-tyred wheels which would ensure that no damage would occur to highly-finished floor surfaces, as found in many smart car showrooms. Given how well products of this type tended to be made, I wouldn't be surprised to hear that a number are still in use - although perhaps with modern cars having overly-wide wheels and tyres, compared to proper cars from years ago, maybe they wouldn't be suitable. I wouldn't mind finding a functioning set of these, although whether my garage floor is even enough to use them I'm not sure.